“Everyone guesses Judi Dench first,” Danielle replied, dashing my dreams of being the most astute and perceptive of people polled. “No, it wasn’t her.” It turns out that Danielle was seated with Jane Fonda, who apparently looks amazing (“I’ve had some work done,” Fonda freely admits) and was wearing dark glasses, presumably to protect her anonymity. Because nothing screams anonymity like wearing oversized dark glasses indoors. But this ubiquitous Hollywood disguise actually worked, and Danielle was at first stumped by her seatmate’s familiar yet indistinguishable visage, but she eventually identified Fonda through her distinctive voice. Fonda broke the ice at some point and she and Danielle chitchatted, with Danielle playing it cool, never once slipping up and calling her Barbarella. Fonda has long been politically active and at 80 shows no sign of slowing down; she was on her way to Seattle to attend a fundraiser for Pramila Jayapal, who is running for a U.S. House of Representatives in Washington’s 7th Congressional District. And because you want to know as much as I did, Fonda was wearing designer leg-stripe sweatpants and high heels — oh, the daring sartorial choices of the fashion-forward! Fonda took advantage of Horizon Air’s free drink policy and had white wine with sparkling water and lots of ice. And when the plane landed, Fonda jumped up with the agility you might expect of the former aerobics queen, scampered to the front, and was the first to de-plane. 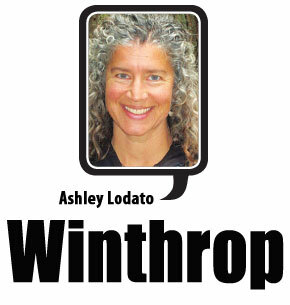 I think this week’s Halloween column marks my 10-year anniversary at the Methow Valley News. A full decade of prying into people’s personal lives and making them public! Scary, huh?